Upcoming new Tollywood Bengali film Jole Jongole movie story review castings director producer actors actresses Jole Jongole release dates book buy tickets online Bengali Jole Jongole Mithun-Mumtaz-Tinu. Photos pictures wallpapers download mp3 songs Jole Jongole Mithun-Mumtaz-Tinu. New Bengali movie review plot shooting location cinema halls showing Jole Jongole kolkata Bengal show timings upcoming hit Bengali cinema Jole Jongole watch online details information. Bengali Film Director Nitish Ray featured actors like Mithun Chakraborty & Tinu Anand (Bollywood Superstar) in his upcoming Bengali movie Jole Jongole, which is a Thrilling Drama. Famous musician Jeet Ganguly tuned up the songs of Jole Jongole Bengali Movie using the voice of Shaan & Sreya. 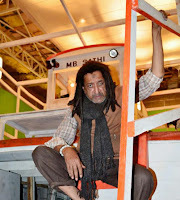 • Jole Jongole Bengali movie Director Name: - Nitish Roy (Debut movie as film Director). • Jole Jongole Bengali movie Producer name: - Prayag Group. • Jole Jongole Bengali movie story writer name: - Director himself is the story writer of this movie. • Jole Jongole Bengali movie Music Director Name: - Jeet Ganguly. • Jole Jongole Bengali film Casts Actors Actresses: - Mithun Chakraborty, Jackie Shroff, Ashish Vidyarthi, Tinnu Anand, Dibyendu Bhattacharya, Biswajit Chakraborty, Mumtaz Sorcar, Titas Bhowmick, Pamela Singh Bhutoria, Sayantani Guhathakurta, Riju Biswas, Sayak, Rajdeep Gupta, Anindya, Dhruba Lal, Dijana Dejanovic, Mumaith khan (for an Item Song) and others. • Jole Jongole Bengali movie Release Date: - not yet finalized. • Jole Jongole Bengali movie Story Review: - Jole Jongole Bangla Cinema is a Drama & Thriller. The Jole Jongole Bengali film is based on the experiment done by a mad scientist (Mithun Chakraborty) who comes up with a lovable crocodile, was implanted with intelligence. At this point, an NRI (Jackie Shroff) eyes this project as he wants to build his own Jurassic Park and wants to get control on this crocodile. • Shooting Location Spot of Jole Jongole Bengali Cinema: - Prayag Film City of Midnapur and other locations. The large crocodile was created using the advance digital technology at Prayag Film City of Bengal. Jole Jongole Bengali Movie will be remade in Hindi named 'Gehra Paani' with higher budget than Bengali version with Sanjay Dutt playing the role of Mad Scientist instead of Mithun Chakraborty soon. Tollywood film Jole Jongole of Mithun-Mumtaz-Tinu & Others., upcoming new Bengali movie, seems to be worth watching in Cinema Halls; so start buy tickets online of Jole Jongole from www.bookmyshow.com website. Upcoming new Tollywood Bengali film Nobel Chor (The Nobel thief) movie story review castings director producer actors actresses Nobel Chor release dates book buy tickets online Bengali Nobel Chor Mithun Chakraborty. Photos pictures wallpapers download mp3 songs Nobel Chor Mithun Chakraborty. 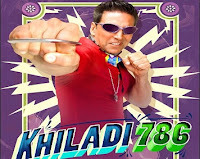 New Bengali movie review plot shooting location cinema halls showing Nobel Chor kolkata hooghly howrah Bengal show timings upcoming hit Bengali cinema Nobel Chor details information. Few year back, Rabindranath Tagore’s Nobel Prize got stolen and this Socio-Economic Cultural relevant event is the plot of upcoming Bengali Film Nobel Chor (The Nobel Thief) that has the strong casting including ‘Mithun Chakraborty’. This Bangla Cinema Nobel Chor was start its shooting way back in February-March of 2011 and in February 2012 it’s finally going to release. • Nobel Chor Bengali movie Director Name: - Suman Ghosh. • Nobel Chor Bengali movie Producer name: - Ashwani Sharma (Impact Films). • Nobel Chor Bengali movie Cinematographer name: - Barun Mukherjee. • Nobel Chor Bengali movie Music Director Name: - Bikram Ghosh. • Nobel Chor Bengali film Casts Actors Actresses: - Mithun Chakraborty as Bhanu, Soumitra Chatterjee as Mastermosai, Arindam Sil as SP of Birbhum, Harsh Chaya as Raj, Roopa Ganguly as Diya, Shashwata Chatterjee as Hari, Sudipta Chakraborty as Monu, Soma Chakraborty as Bhanu's Wife, Shankar Debnath as Manmotho Pagla and many others. 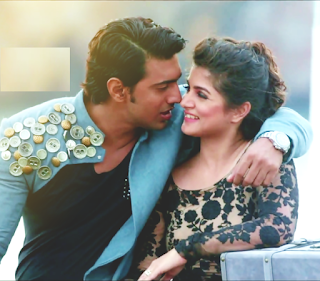 • Nobel Chor Bengali movie Release Date: - 17th February 2012. • Nobel Chor Bengali movie Story Review: - Storyline of Bengali movie Nobel Chor of Mithun Chakraborty is the story based on Kabiguru Rabindranath Tagore’s Nobel Award Theft case that was happened in 2004. In this film Nobel Chor; Mithun Chakraborty is playing the role of a poor farmer named ‘Bhanu’ who has that Nobel Prize of Rabindranath Tagore and came to Kolkata to sale it. Bhanu (Mithun Chakraborty) has the dream of developing his village and to educate children of his village to give them good future life. But, in Kolkata, Mithun Chakraborty (Bhanu) gathered the real socio-economical values & greed of people while selling his Nobel prize. Nobel Chor Bangla Cinema also focuses on the relevance philosophy of Kabighuru Rabindranath Tagore in recent times. • Shooting Location Spot of Nobel Chor Bengali Cinema: - Birbhum district of West Bengal and in Kolkata Studio. Check few photos of Nobel Chor Film Making. • Cinema Halls showing Nobel Chor Bengali movie: - Multiplexes of Kolkata like FAME, INOX, South City, Axis Mall etc and Movie Theatres in Kolkata like Prachi, Metro, Purabi, Ajanta. Burdwan Loksanskriti Hall, Durgapur Inox, Siliguri Inox, Shankar Cinema hall of Habra and many other Cinema halls are going to show Nobel Chor Bengali Movie of Mithun Chakraborty from 17th February 2012. Mithun Chakraborty’s Bangla Cinema Nobel Chor received the Best Film Award at Chitrabharathi Competition Section of 2011 at Bengaluru International Film Festival and selected for 16th Busan International Film Festival and BFSI London Film Festival. 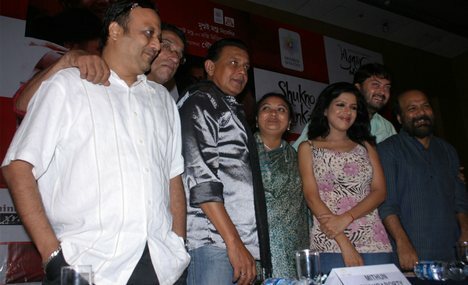 Moreover, Nobel Chor Bengali Film has been nominated in Dhaka International Film Festival 2012. Tollywood film Nobel Chor of Mithun Chakraborty & Others., upcoming new Bengali movie, seems to be worth watching in Cinema Halls; so start buy tickets online of Nobel Chor from www.bookmyshow.com website. You can get the latest news updates of Nobel Chor Bengali Movie for free and for that you need to just 'LIKE' the Official Facebook Page of Nobel Chor. Nobel Chor - Upcoming Bengali Movie of Directror Suman Ghosh featuring Mithun Chakraborty, Sudipta Chakraborty, Saswata Chatterjee etc. This picture of Nobel Chor Bengali film Shooting. Photo of Actress Sudipta Chakraborty, who is playing the character of Mithun Chakraborty's wife in the upcoming Bengali film Nobel Chor. Bengali Filmmaker Suman Ghosh, who is the director of new Bengali Tollywood Movie Nobel Chor.